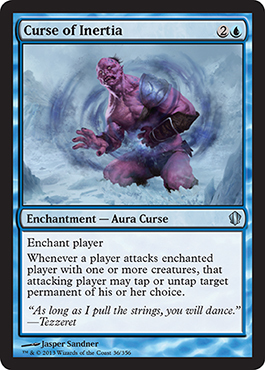 A new Commander product means a new uncommon cycle, and this time around we get curses. With the other curses freshly rotated out of standard, I might as well take a look at them. Curse of Thirst and Curse of Misfortunes – These are what I’d consider the big two and only get top billing for being the core of curse decks. I’ve honestly never seen a curse deck outside of 60 card casual, but after looking into them for this, I might just make one. 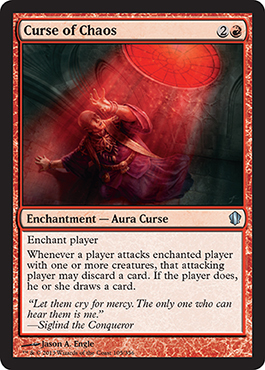 The biggest problem with curses is that once the cursed player is dead, they all fall off, so recursion is mandatory, which is viable in each of the other three colors. I’m inclined to go to White because it has the most actual enchantment recursion, specifically Replenish. 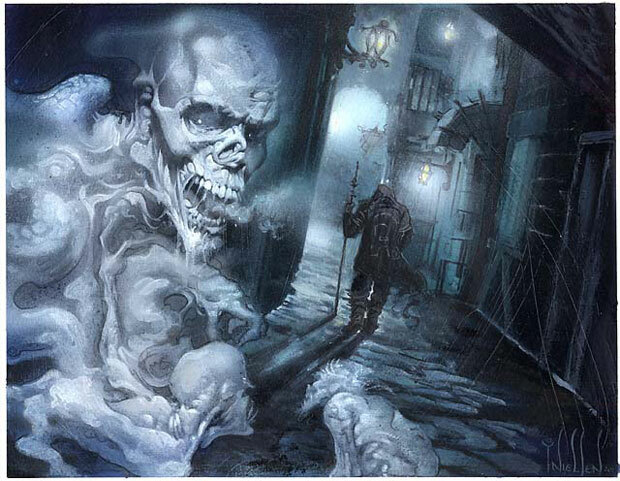 Curse of Bloodletting – This is probably my pick for best curse in the format, it can be used politically to take out one of your opponents or as a finisher later on. Curse of Exhaustion – A targeted Teferi will likely draw you a lot of hate, but it works, especially if you’re still exploiting Knowledge Pool. Curse of Echoes – Chaos AND politics! Two of my favorite things. Every game I’ve seen this card land in instantly became more fun for everyone who wasn’t cursed. Curse of the Bloody Tome – Self-mill decks love it, especially The Mimeoplasm. Curse of Death’s Hold – Kills utility creatures and tries to keep token armies in check; it’s a bit expensive, though. Curse of Oblivion – This only gets ranked above the last few because it’s graveyard hate, which is relevant even if it is slow and generally bad. Curse of the Pierced Heart – Pinging… Well, it’s something. Curse of the Nightly Hunt – It clears out any blockers they might have but if someone has creatures, they generally plan on attacking with them or using them for things other than blocking. Curse of the Forsaken – Lifegain for each attacker. This feels like something a token deck might want, maybe Darien, King of Kjeldor. For the most part, though, I don’t see this getting played much. Curse of Inertia – Tap or untap something whenever you attack… I’m sure there’s a combo with this somewhere, I’m just not sure where… If nothing else, you get pseudo-vigilance. Curse of Shallow Graves – A tapped zombie whenever you attack… Probably the second worst, it’s slow and doesn’t give much for your effort. Curse of Chaos – Red looting isn’t exactly what I’d call chaotic, so the name of this fails for me, but it’s probably the best of the cycle. Curse of Predation – A +1/+1 counter whenever a creature attacks. It’s certainly better than Curse of Stalked Prey, and GW tokens is still a thing. For now, I’m going to call it playable. Well, that’s all I have for now. I have a pretty full schedule for next week, so don’t expect an article, but if I happen to find the time to write one, I’ll post it. If not, see you next month!